FA: Alan Roberts, Alan Bartlett, Dan McMillan, Tom Prentice, July 1980. A tricky boulder problem start, protected only by a questionable old thin piton, leads to an excellent finger and hand crack in a steep groove. You can easily avoid the crux boulder problem by climbing the start of Geekin’ Hard (bouldery 5.10d, but with good pro), then stepping right. The second pitch steps left up wild, steep liebacking with poor pro (RPs, tricky 3-3.5”cam), leading to a burly hand traverse/mantel and a bolt. Make a tenuous step left onto a ramp, and another bolt (which protects the follower very well). 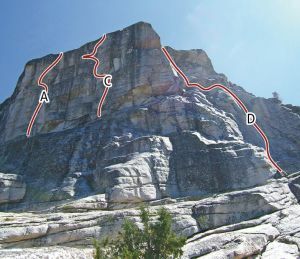 You can climb up then straight left to a bolted belay, but it’s best to skip this and climb right past another bolt to a knobby thin crack which leads to the summit. If you use the intermediate belay, the traverse from the belay to the bolt is very intimidating, especially for the follower. Like the neighboring routes, expect a bit of lichen and grainy rock. Which SuperTopo guidebooks include a topo for Pencil Necked Geek?